Lucy and I go grocery shopping every week. I remember going shopping with my dad when I was little. I would ride in the trolley and we would pick out all the things we were going to buy. As I got older, Dad would have me get a bag of apples or the best value packet of cheese. It was a really great way to learn how to shop. So now, I'm passing it all on to Lucy. I give her the groceries and she drops them into the trolley behind her. She does quality control on the grapes and drops mushrooms into the bag. She requests lots of cheese and insists on dipping her hands into the ice that cushions fruit salad and freshly squeezed orange juice. She loves a slice of banana bread for a treat if she has been good. but sometimes has a little meltdown. 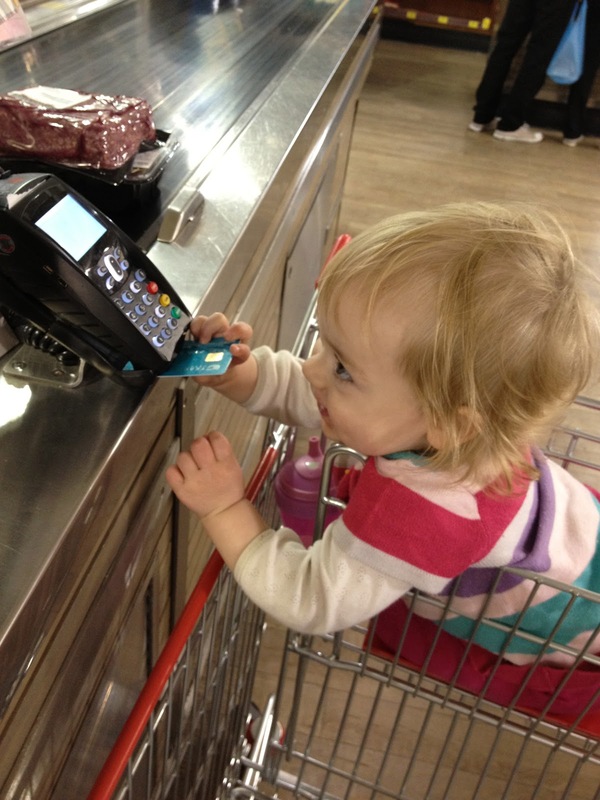 When we get to the counter she loves to use my card and press all the buttons on the eftpos machine. The best part of the trip is a ride on the escalator.